Modern websites strive to provide the ultimate user experience. 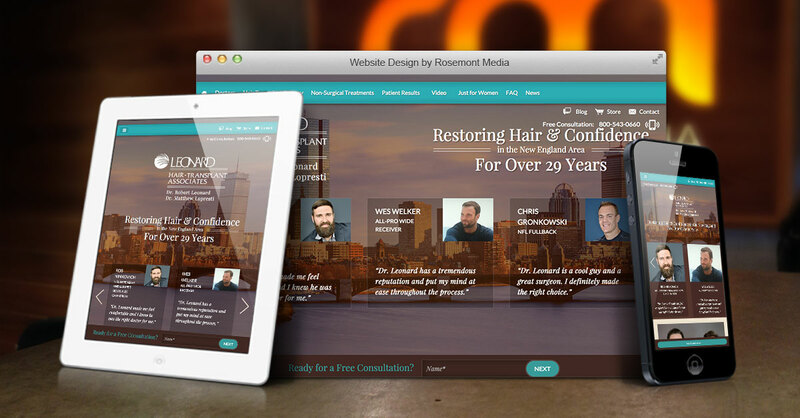 With that objective in mind, hair restoration surgeons Dr. Robert Leonard and Dr. Matthew Lopresti of Leonard Hair Transplant Associates recently upgraded their practice website with Rosemont Media’s assistance. Equipped with state-of-the-art functionality and a visually stimulating layout, the new site features a selection of advanced features hand-selected by the physicians. In addition to highlighting real patient photos and testimonials, visitors can view instructional videos, schedule a complimentary consultation, and generate turn-by-turn directions to any of their seven office locations. Leading medical SEO strategies and a responsive design further enhance a user’s ability to find and access the information they seek from virtually anywhere. To see an example of a website tailor-made by Rosemont Media, please visit www.hairdr.com.